Lego Design by Me: What building to Minifigure scale means. What building to Minifigure scale means. I did have an ambitious thought as to whether I could build an Imperial Star Destroyer to minifigure scale - only a fleeting thought though, because once you start working it out - it becomes a daunting task. Firstly, an ISD is 1.7 km long, if a 2 metre person is represented by a 2 cm minifigure then that's a 1:100 scale. So were talking of 1700 metres, or 170,000 cm knocking two noughts off makes it 1700 cm or 17 Metres. So even if detailed plans of what the Imperial Star Destroyer interior was like existed, you would be aiming to build a lego set nearly 20 metres long, and it's probably half that wide at the widest point. To test the costing of such a large model I built a layered twin wing section last night in Design by me. I grouped and duplicated it until I had about 45 cm of wings - the price £50 Now you would need an upper and a lower for this so for the wings outer edges, you have to think £200 per metre. So for the basic outer shell, super structure we would be talking about spending in excess of £4000 with no interior, command bridge, hangar, fighter craft or crew or even exerior detail.I can imagine the cost would actually run up to in excess of £40,000 minifigures alone would be a problem. Including the pilots and Stormtroopers an ISD had over 45,000 staff on board. Considering buying used Starwars Lego figures is the only way to get the correct crew at the moment without buying sets, assuming you used that method to crew the entire crew at what seems to be the going rate of about £5 you would spend £225,000 on crew alone... Assuming there were enough used Stormies and Imperial Officers to crew it in existance and avaialable to buy. What would be nice was a collaboration between Lucas and Lego and a full minifigure scale Lego Star Wars Theme park, with minifigure scale ISD's, Super Star Destoyers and a Death Star (Officially the first one was 160 km diameter so that's 16,000,000 cm diameter so minifigure scale makes it 160,000 cm or 1600 M - 1.6 km making the volume about 2,144,660,584 cubic metres....) Of course the second Death Star was supposedly 900 M diameter so that makes it 90,000,000 cm diamter, minifigure scale 9 km diameter... Volume... Oh forget it... You get the idea! Minifigure scale large Lego Star Wars ships are basically impractical to the point of being ridiculous. 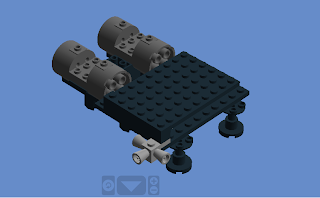 As for my set - the second engine in place, the flat bit will be where the pilots sit. It's funny I'm considering getting into Lego as an adult, as a hobby. For a long time all my spare time was thrown at Taekwondo I even made a taekwondo website to help people with patterns. I ought to start training again. Lego is fun but it doesn't get you fit!